Australia and New Zealand are generally accepted as having cornered the market on bizarre adventure activities, especially in urban areas. 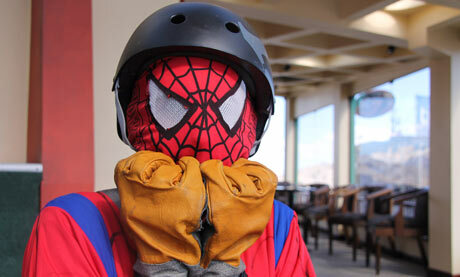 Unsurprising, then, that Alistair Matthew, the Kiwi founder of La Paz’s ginormously successful, groundbreaking Gravity Assisted Mountain Biking, has brought a bit of the Antipodes to Bolivia’s capital city. A year ago, inspired by a similar enterprise in Melbourne, Matthew launched Urban Rush. 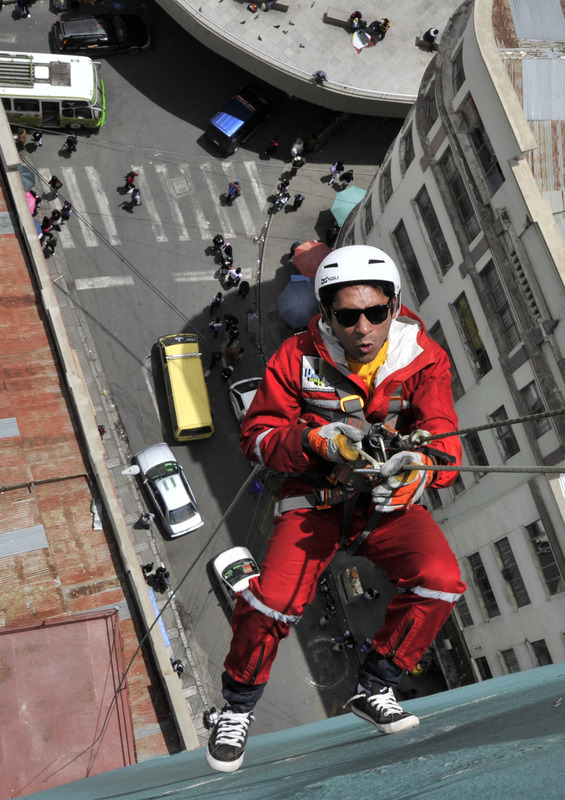 The sport, also known as rap jumping, entails rappelling – preferably face-first – down the side of a 17-story building in central La Paz (the view, FYI, is spectacular; it’s across the street from the colonial stunner that is the San Francisco Church), and provides views of the tenaciously perched brick houses of El Alto. The kicker, however, is that the final six stories are in free fall (that’s me, above, about five stories before taking the plunge). It’s not as sketchy as it sounds. In addition to your own power (meaning you have a brake and a guide hand), there’s an experienced guide belaying you from below, and another controlling you from the top. So even if you were to let go completely, you’ve got two ropes as backup. The aforementioned building is the Hotel Presidente, La Paz’s finest. That only makes for more fun, as costume-clad, thrill-seeking, dirtbag backpackers traipse through the stylish 15th floor restaurant and bar in order to access the small penthouse space where suiting up and training take place. Costumes? Si. In addition to the standard bright orange jumpsuits, you can leap out of the hotel dressed as Spiderman, Captain America, Santa Claus or Cat Woman, masks included. Why? Who cares? I serendipitously found myself watching a Spiderman launch himself out of the penthouse yesterday afternoon, while out with Gravity’s office manager, Jill Benton. She had a hunch this would be right up my alley, and sure enough, I soon found myself zipping up a jumpsuit (no heroic attire; I just wanted to survive the experience; the view from the top, at right). In all seriousness, Gravity’s guide/instructors are experienced employees and the equipment is all top-of-the-line. I’ve done a bit of climbing and abseiling, but never have I contemplated a face-first rappel, let alone in the middle of a bustling city. In fact, I have a deathly fear of jumping off of or out of things in urban areas (because, you know, death hurts less when you’re out in nature). After strapping on my helmet and having my harnesses fitted, instructor Andrea did some practice maneuvers, first on the ground and then on a six-foot wall (right). When I felt ready to bail out that window, it was at first tentatively, and not very gracefully. Having hundreds of spectators on the ground didn’t do much to increase my performance anxiety. While my technique may have been a Fail (I weigh just under 100 pounds, and that made it difficult for me to hop my way down, rather than roll), it was a total blast. The free fall was definitely one of my adventure activity lifetime highlights: few things can beat plummeting at warp speed upon the Easter shoppers of La Paz. A half-hour later, still trembling with adrenalin (which is why my photo of the hotel, below, is crooked), I was headed back to my hostel across Plaza San Francisco, an uncontrollable smile on my face. Bolivia certainly has no shortage of outdoor adventure sports, but should you find yourself with a little afternoon downtime in La Paz, you’d be simply crazy not to take a flying leap out of the Hotel Presidente. Urban Rush, 1-5 p.m., daily; book in advance or just drop by the hotel, at Potosí St., 920. It’s just $20 for one drop, $30 for two (note that due to fluctuating exchange rates these prices may change). There are lots of classic must-dos for the round-the-world tripper but diving with crocs, abseiling like Spider-Man and cooking iguanas are just a few of the newest activities to add to the list. Classic Cycling the “world’s most dangerous road”; cholita wrestling in La Paz; photos on the salt flats; the silver mines in Potosí to give miners coca leaves and dynamite. 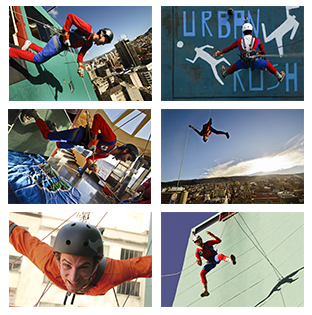 New At Urban Rush, travellers dress up as Spider-Man, Captain America or Catwoman and step off a 50m-high ledge in central La Paz, to abseil, face first, and then freefall, from the 17th floor, for 140 Bolivianos (£13). 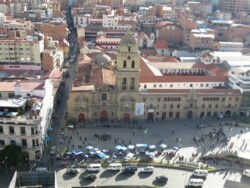 New Air Europa flights into Bolivia touch down in Santa Cruz, a city low on backpackers’ lists. But more and more are discovering nearby Samaipata, with its excellent hiking, ancient ceremonial site and condor-spotting opportunities. It’s also the gateway to Parque Nacional Amboró, which has more species of birdlife than any protected area in the world, so could become the new Rurrenabaque (the base town for trips into the Bolivian Amazon). Ben Verhoef Tours has trips. I’m starting my trip, however, with the city’s two main adrenalin challenges – one old, one new. Up first is one of the planet’s most famous backpacking experiences – cycling down the world’s most dangerous road. Given that label by the Inter-American Development Bank in 1995, due to the horrific number of fatal accidents, this stretch of the La Paz to Coroico road is thankfully not what it once was, due to a recent highway taking much of the traffic elsewhere, but it still makes for a white knuckle ride. Fortunately, we’re wanker-free and succeed, reaching the bottom elated, exhausted and totally unprepared for the even scarier bit – driving back up the mountain to La Paz in the dark. Next is an altogether different challenge. I’m to dress up as Spider-Man and jump out of a 17th floor window. Yes, you read that right. 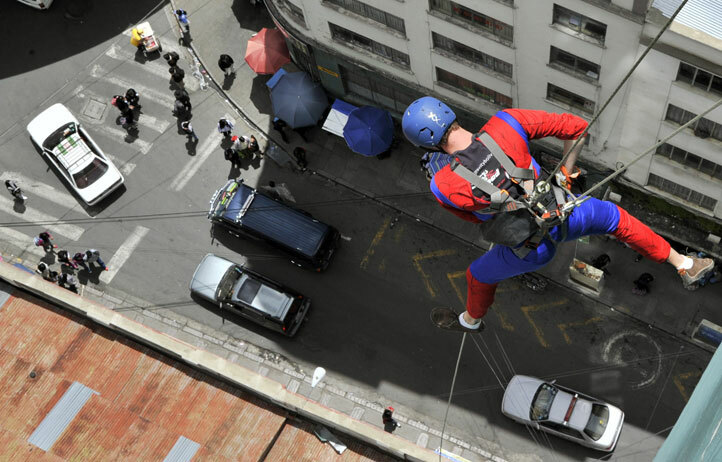 One of the newest and most amusing thrills on offer in Latin America is Urban Rush, which involves donning a superhero outfit before stepping, face first, out of a central La Paz building, 50m above the ground, for an abseiling/freefalling combo, all while some very bemused Bolivians look up from below. Equal measures terrifying and hilarious, I’m relieved it’s only the views that are to die for. What to do: The Chaskis Hop, from La Paz to Lima, with Green Toad (www.greentoadbus.com) costs from £263. Biking the world’s most dangerous road with Gravity Bolivia (www.gravitybolivia.com) costs from £65. 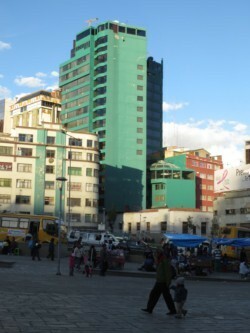 Urban Rush (www.urbanrushbolivia.com), in La Paz, costs £13. Where to sleep: Beds at the Adventure Brew Hostel (www.theadventurebrewhostel.com) in La Paz cost from £4. Rooms at Hostal Las Olas (www.hostallasolas) cost from £10pp. Beds at HI Inka Pacha (www.hihostels.com) on Isla Del Sol cost from £3.50. Beds at Bothy Hostel (www.bothyhostel.com) in Puno cost from £5. Beds at Milhouse (www.milhousehostel.com) in Cusco cost from £6. Beds at Desert Nights (www.desertadventure.net) in Huacachina cost from £5. Beds at Flying Dog (www.flyingdogperu.com) in Lima cost from £7. Un ‘viaje’ en ‘rap-jumping’ cuesta alrededor de 20 dólares. 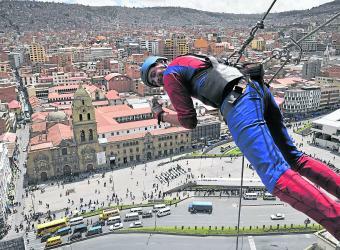 El ‘rap-jumping’ se ha convertido en novedad en La Paz, Bolivia. Una pareja de turistas israelíes se dispone a descender por las paredes de un hotel en La Paz. Él va vestido como el Hombre Araña y ella como Gatúbela, y por unos minutos podrán sentirse superhéroes. “Creo que estamos locos”, dice ella a su novio antes de descender 50 metros, los últimos 20 en caída libre, en lo que se conoce como ‘rap-jumping’, un deporte extremo que en la capital boliviana se practica a 3.600 metros sobre el nivel del mar y con vista de calles coloniales y nevados andinos. “Es lo más extremo que he hecho, estoy demasiado nerviosa”, dice exultante Shir Cohen, de 21 años, exrecluta del ejército de su país, al llegar a tierra. “He hecho paracaidismo y ‘bungee’, pero esto fue muy divertido, mi corazón está latiendo muy fuerte”, cuenta tras un descenso boca abajo en 2,54 minutos, sujetada a una cuerda. Tras ella baja su enamorado, Liron Sitrek, guardia de seguridad. “Es grandioso, es lo mejor que hecho en mi vida, es muy excitante y divertido”, asegura. El ‘rap-jumping’, que instaló en La Paz el estadounidense Derren Patterson, de 27 años, es una mezcla de las palabras ‘rapel’, descenso de superficies verticales con cuerdas y arneces, y la inglesa ‘jumping’ (saltar). “El rapel es el descenso en posición de sentado, pero el ‘rap-jumping’ es de frente, el cuerpo debe estar en posición horizontal, boca abajo. Al bajar se pueden hacer saltos hasta la parte final, dice Patterson, uno de los principales socios de la compañía boliviana Urban Rush. 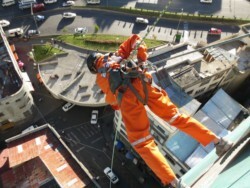 El descenso se realiza desde un piso 17, en la parte posterior de un céntrico hotel de La Paz, hasta una terraza metálica, especialmente habilitada. Los últimos 20 metros, en caída libre, se realizan a una velocidad aproximada de 10 metros por segundo, y se frena bruscamente muy cerca del piso. La persona es sujetada por dos cuerdas: una agarra al aventurero y la otra sirve como seguridad. Ambas pueden soportar hasta 1.500 kilos. Además, varios juegos de arneses entrelazados entre el pecho y la espalda dan mayor certeza. “Es espectacular, impresionante, es un gran espectáculo”, dice desde una calle vecina el boliviano Mario Ticona, tras observar lo que está ocurriendo. “Sé que se hace ‘rap-jumping’ en Australia, pero es único en Bolivia, y es único en un edificio de tanta altura”, agrega el empresario norteamericano. En la empresa trabajan como guías de seguridad varios bolivianos, entre ellos Andrés Thellaeche, de 22 años, y Fernanda Agreda, de 24. Ella es además rescatista de una unidad de voluntarios que apoya a la policía de Bomberos. Ambos se encargan de dar instrucciones básicas a los aventureros de cómo colocarse los cascos y usar guantes de cuero, cómo descender y cómo colocar el cuerpo sobre la pared, usar las manos y cómo soltar o ajustar las cuerdas. Como si no fuera suficiente estar parado a tanta altura, el equipo suma nerviosismo a la aventura y sube el volumen de una música rock que aumenta el clímax. Patterson relata que tuvo como clientes desde un niño boliviano de 12 años hasta un anciano de 60 años, a mediados del año pasado. ¿Cuánto cuesta el descenso? “Por una única vez cobramos 140 bolivianos (unos 20 dólares) y por dos veces 200 bolivianos (unos 28,7 dólares)”. “Es una ganga para tener tanta adrenalina”, dice Patterson mientras sonríe con picardía. “Rap-jumping,” a new extreme sport, involves jumping from a building and rappelling 17 floors. 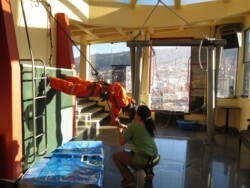 Tourists test their courage at a hotel in La Paz, Bolivia. 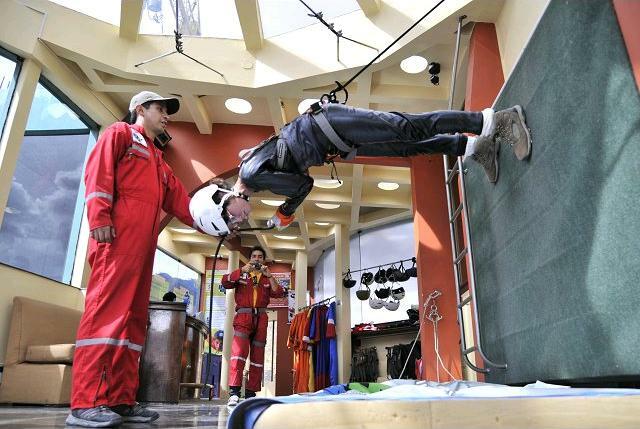 Israeli tourist Shir Cohen starts going down the wall of a hotel in La Paz on February 27, 2013. Cohen, 21, went down some 50 meters from the 17th floor of a hotel to a terrace. “Rap-jumping” is an extreme sport named from the French word “rappel” — descent of vertical surfaces with ropes and harnesses — and English word “jumping”. US businessman Derren Patterson, owner of the company “Urban Rush”, practices “Rap-jumping” at a hotel in La Paz on February 27, 2013. Patterson went down some 50 meters from the 17th floor of a hotel to a terrace. “Rap-jumping” is an extreme sport named from the French word “rappel” — descent of vertical surfaces with ropes and harnesses — and English word “jumping”. Una pareja de turistas israelíes se dispone a descender por las paredes de un hotel de La Paz. El va vestido como el “Hombre Araña” y ella como “Gatúbela”, y por unos minutos podrán sentirse superhéroes. “Rap-jumping” es un deporte extremo, el nombre proviene de la palabra francesa “rapel” de descenso de superficies verticales con cuerdas y arneses, y la palabra Inglés “salto”. La propuesta es bajar 50 metros en rapel por la fachada de un hotel de 17 pisos, en el centro de la capital boliviana. Ciudad de México, México.- ¿Eres amante de la adrenalina? Bolivia tiene algo para ti. El ‘rap-jumping’ es un deporte extremo, el nombre proviene de la palabra francesa ‘rapel’ de descenso de superficies verticales con cuerdas y arneses, y la palabra en inglés ‘salto’. Si quieres vivir esta aventura, sólo acércate al piso 17 del Hotel Presidente (calle Genaro Sanjinés esquina Potosí). 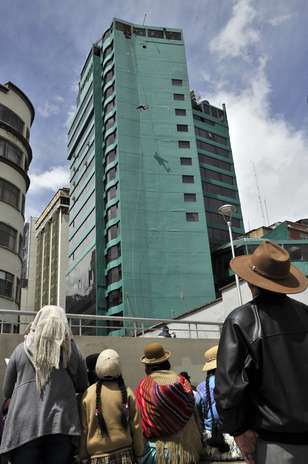 El empresario, Derren Patterson, propietario de la empresa Urban Rush, practica Rap-jumping en un hotel de Bolivia. Patterson cayó unos 50 metros desde el piso 17 del edificio a una terraza. 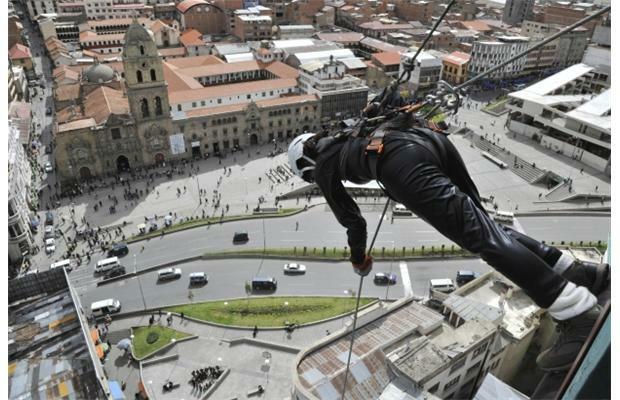 LA PAZ, Bolivia.- …El “rap-jumping”, que instaló en La Paz el estadounidense Derren Patterson, de 27 años, es una mezcla de las palabras “rapel”, descenso de superficies verticales con cuerdas y arneces, y la inglesa “jumping” (saltar). “El rapel es el descenso en posición de sentado, pero el ‘rap-jumping’ es de frente, el cuerpo debe estar en posición horizontal, boca abajo. Al bajar se pueden hacer saltos hasta la parte final”, dice Patterson, procedente del estado de Washington, uno de los principales socios de la compañía boliviana “Urban Rush” (rapidez urbana). Mientras los turistas bajan se escucha la exclamación de algún transeúnte que observa atónito. “Es espectacular, impresionante, cómo uno no quisiera bajar o saltar, es un gran espectáculo”, dice desde una calle vecina el boliviano jubilado Mario Ticona, tras observar lo que está ocurriendo. “Sé que se hace ‘rap-jumping’ en Australia, pero es único en Bolivia, y es único en un edificio de tanta altura”, agrega el empresario norteamericano, quien se define como un “trotamundos”. En la empresa trabajan como guías de seguridad varios bolivianos, entre ellos Andrés Thellaeche, de 22 años, y Fernanda Agreda, de 24. Ella es además rescatista de una unidad de voluntarios que apoya a los bomberos. 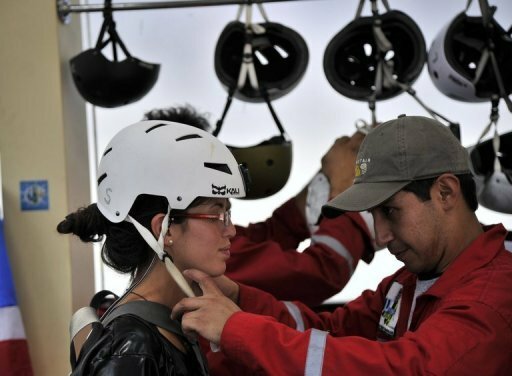 Ambos se encargan de dar instrucciones básicas a los aventureros de cómo colocarse los cascos y usar guantes de cuero, cómo descender y cómo debe colocar el cuerpo sobre la pared, usar las manos y cómo soltar o ajustar las cuerdas. Los organizadores comentan a la AFP que fueron testigos de escenas de pánico, pero que nunca se produjo un accidente. “Hace unos cinco meses he visto a una chica que se quedó paralizada tres horas en la ventana, no podía bajar, ni volver a entrar al edificio, pero después la animamos”, agrega Fernanda, quien dice hacer el descenso en 7 segundos, mientras que sus compañeros, los más avezados, lo hacen en 4 segundos. Patterson relata que tuvo como clientes desde un niño boliviano de 12 años hasta un anciano norteamericano de 60 años, a mediados del año pasado. Miercoles, 27 de febrero 2013 | 12:11 am. Un edificio de la ciudad de La Paz, Bolivia es escenario para que atrevidos turistas realicen descensos verticales extremos desde una altura de 50 metros. La empresa “Rush Urban”, cuyo propietario es el empresario estadounidense Derren Patterson, ofrece la aventura a arriesgados turistas que se lanzan frontalmente en un descenso vertical desde el piso 17 de un edificio (50 metros). El “Rap-jumping” es un deporte extremo cuyo nombre proviene de la palabra francesa “rapel”-descender de pendientes verticales con cuerdas y arneses, y la palabra Inglés “saltando”. A diferencia del descenso a rapel que se realiza dando la espalda al vacio y con ambas manos sujetando la cuerda para graduar la velocidad y distancia de caída, el “Rap-Jumping” se realiza dando la cara al vacío y sin sujetar la cuerda, claro que bajo extremas medidas de seguridad. Ref. Fotografia: El descenso se realiza desde un piso 17, en la parte posterior de un céntrico hotel de La Paz, hasta una terraza metálica. “Es lo más extremo que he hecho, estoy demasiado nerviosa”, dice exultante Shir Cohen de 21 años, exrecluta del ejército de su país al llegar a tierra. “He hecho paracaidismo y ‘bungee’, pero esto fue muy divertido, mi corazón está latiendo muy fuerte”, cuenta a la AFP, tras un descenso boca abajo en 2,54 minutos, sujetada a una cuerda.